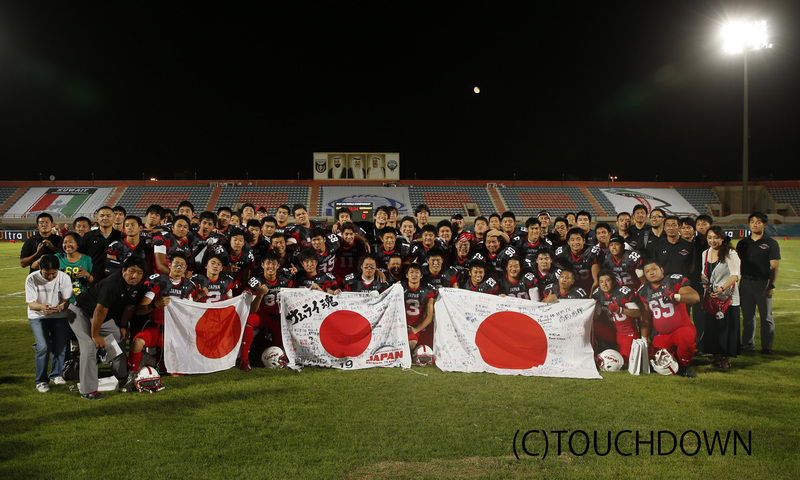 (July 19, 2014) - RB Nanato Nishimura and WR Yoshihito Omi scored two touchdowns each to help Team Japan to a 30-7 win against France in the game for fifth place at the U19 World Championships in Kuwait. Japan had to settle for the 5th place game because a 43-0 loss to Team USA and Mexico's 35-7 win against Germany in the final round of group play pushed the team to third place in Group B. After falling behind early - France needed just four plays to take a 7-0 lead - Japan scored almost every time the offense had the ball. Eight plays after the french lead Nishimura scored Japan's first touchdown with a 2-yard run. Japan's second possession ended with a 42-yard field goal by Akio Yamagishi for a 10-7 lead at the end of the first quarter. Japan increased the lead to 17-7 at halftime with a 17-yard touchdown pass by QB Yuto Nishiyama to Omi at the end of an 8-play 84-yard drive. France had a great opportunity to get within three points early in the fourth quarter but a remarkable drive (20 plays, 80 yards) that started at their own 10-yard-line and took more than eleven minutes ended with a 2-yard run to Japan's 10-yard line on a fourth down and four yards needed for a new first down. And things got even worse for France. Japan engineerd an 11-play 90-yard drive that had taken six and a half more minutes off the clock when Nishimura ran the ball into the endzone from three yards out for a 24-7 lead. After just three plays by France, including an 18-yard loss on second down, and a punt Japan took over at the 30-yard line of France. On the very next play QB Kaito Hyakuda threw a 30-yard touchdown pass to Omi. 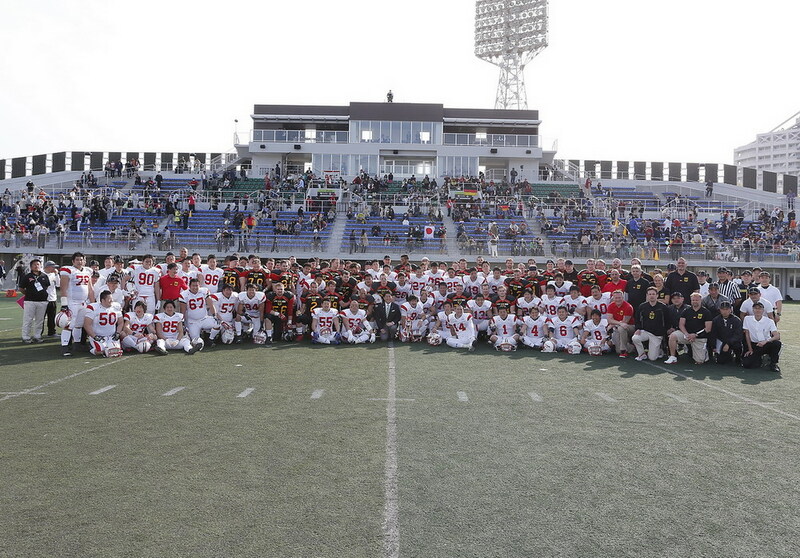 (July 13, 2014) - Later today Team Japan has to beat Team USA in the final game of group play to advance to the championship game at the IFAF U19 World Championships in Kuwait. Both teams go into that game unbeaten. Team USA won both previous games in Group B against Mexico (49-14) and Germany (54-0) while Japan had to settle for a tie in the second game against Mexico (24-24) after beating Germany in game one (48-20). The winner of this game will face the winner of the battle for first place in Group A, Canada against Austria. If Japan would lose to the USA the outcome of the Mexico versus Germany game would determine if Japan plays for third place against the loser of the Canada versus Austria game or for fifth place against either France or tournament host Kuwait. Japan had a strong start into the tournament with RB Nanato Nishimura giving his team a 20-point lead at halftime against Germany with touchdown runs of 1 and 65 yards plus a 45-yard catch for a touchdown. RB Jerome Manyema gave Germany hope for a better second half with a 74-yard run around left end on the first offensive play of the third quarter. But any hopes for a comeback ended about 20 seconds later when RB Atsuki Noda put Japan back up by 20 points with a 47-yard run on Japan's first offensive play of the second half. In the second game against Mexico it looked like more of the same for Japan. Touchdowns by WR Yoshihito Omi (8-yard catch), RB Nanato Nishimura (6-yard run) and QB Yuto Nishiyama (1-yard run) plus a 32-yard field goal by Akio Yamagishi gave Japan a 24-7 lead at halftime. But in the second half Mexico took over the game allowing just 58 total yards on defense and gaining 249 yards on offense. After the two teams traded punts Mexico started the second possession of the second half with a 50-yard pass that took the team to Japan's 30-yard line. Four plays later Mexico cut Japan's lead to ten points (24-14) with a 5-yard touchdown run. After further cutting the lead to seven points with a 24-yard field goal with about four minutes left in the game Mexico took advantage of a short punt (15 yards) at the end of Japan's next possession. Taking over at midfield Mexico's offense scored four plays later on a 34-yard run to tie the game at 24 with 49 seconds left to play. 1st World University Championship in Uppsala, Sweden. In a battle between previously unbeaten teams Japan lost the final game of the tournament against Mexico 14-6. In a game that was dominated by the two defenses most of the time two long runs by RB Juan Lopez Santana made the difference for Mexico. On the third play of Mexico's fourth possession Lopez Santana ran for 57 yards to Japan's 34-yard line. Two plays later RB Alberto Lopez Silva score on a 10-yard run. In the fourth quarter Mexico had a similar drive. This time Lopez Santana ran for 45 yards to the 3-yard line of Japan on the fourth play. Again two plays later Lopez Silva scored his second touchdown with a 3-yard run that gave Mexico a 14-6 lead with just one minute and 30 seconds left. Japan came within one point early in the third quarter with a 2-yard touchdown run by WR Tatsuya Tonka at the end of an impressive 12-play 80-yard drive and a second long drive (14 plays, 71 yards) following Mexico's second touchdown almost put Japan in position to tie the game. But two incomplete passes in the final seconds after reaching Mexico's 20-yard line sealed Japan's fate. 1st World University Championship in Uppsala, Sweden. In the final game of the five-nation round-robin tournament Team Japan will face Mexico on Sunday, May 11. In the first three games against overmatched opponents both teams scored over 50 points in each game and did not allow a single score. Japan beat Finland 84-0, China 54-0 and host Sweden 57-0. Mexico opened the tournament with a 62-0 rout of Sweden followed by a 53-0 win against Finland in game two and a 55-0 win against China in game three. Scandinavian neighbours Sweden and Finland, both with one win against China, will battle for third place on Saturday, May 10. 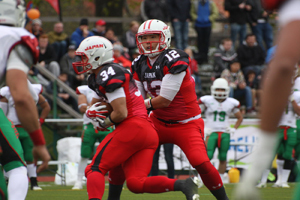 In Japan's opener against Finland former Ritsumeikan University Panthers RB Shu Inoue gained 200 yards and scored four rushing touchdowns on just nine carries. Inoue's former teammate QB Yuichiro Araki completed six of eight pass attempts for 132 yards and three touchdowns, and WRs Keita Suzuki, another former Panther, and Aruto Nishimura (Nihon University Phoenix) had two touchdown catches each. In the two other games former Kyoto University Gangsters RB Ryo Takagi became the top offensive weapon, scoring on a 31-yard run and a 42-yard punt return against China and adding 143 rushing yards and a 35-yard touchdown run against Sweden. Meanwhile Araki became the most effective of Team Japan's four quarterbacks completing 13 of 21 pass attempts for 227 yards and five touchdowns with no interceptions. And the defense through three games allowed just two first downs (one by penalty) and minus two total offensive yards. (April 26, 2014) - It took Japan a total of six offensive plays to turn the World Cup qualifier against the Philippines at Tokyo’s Amino Vital Field into a rout early. In the end Japan beat the Aguilas (nickname of the Philippines’ national team) 86-0 to secure a place in the 2015 World Cup at Stockholm, Sweden. On the first offensive play QB Shun Sugawara threw a 56-yard touchdown pass to WR Yasuhiro Miyamoto, on the second play of Japan’s second possession Sugawara connected with TE Akimitsu Mori for a 24-yard touchdown pass and Japan’s third drive ended on the third play with a 9-yard touchdown pass from QB Shohei Kato to WR Shoma Endo for 21-0 lead seven minutes into the game. Against an inexperienced opponent Japan scored in almost every possible way, adding five rushing touchdowns, a punt return for a touchdown, an interception return for a touchdown, a fumble return for a touchdown, a safety and twelve PATs. It took almost three quarters before the Philippines’ offense that finished the game with minus 45 total yards reached their first - and only - first down of the game. Following a touchdown that increased Japan’s lead to 58-0 the Philippines gained 18 yards in five plays - 15 through a pass on fourth down. Unfortunately the sixth play of the drive ended with an interception an a 62-yard return for a touchdown by DB Hidetoshi Yano that gave Japan a 65-0 lead in the final minute of the third quarter. 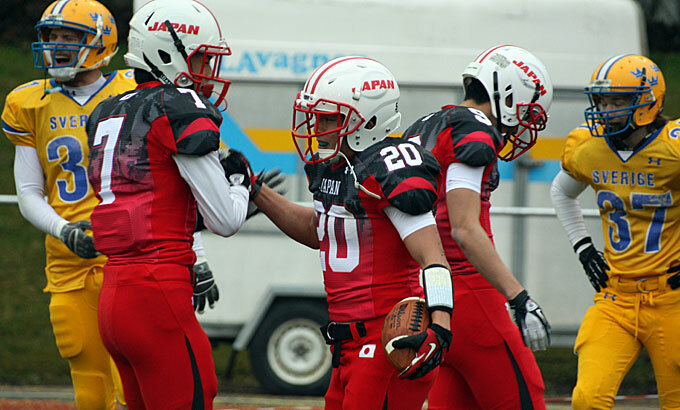 It will be Japan’s fifth World Cup appearance in as many IFAF World Cup tournaments. Japan won the first two in 1999 in Italy and 2003 in Germany, finished second in 2007 at Kawasaki and third in 2011 in Austria. (April 14, 2014) - In a rare international exhibition game Japan beat Germany 38-0 at Kawasaki's Fujimi Stadium in the second edition of the German-Japan Bowl. Japan's offense did most of the damage through the air with QBs Shun Sugawara, Shohei Kato and Keiya Hiramoto throwing for a combined five touchdown passes. WRs Naoki Maeda and Ryoma Hagiyama each caught two touchdown passes. Team Japan lead only 14-0 at halftime but three touchdowns in the fourth quarter on consecutive possessions, two following interceptions, turned the game into a rout.